We’re closing in on that historic solar eclipse, just 10 days away, but another spectacular show in the cosmos will light up the night sky this weekend, providing a flashy opening act. On Friday and Saturday night, we’ll get a great glimpse of the annual Perseids Meteor shower at its peak. With a chance of scattered thunderstorms on Friday night, it looks like Saturday night (partly cloudy) will provide the best chance to see some of the meteors streaking across the sky. If you live in the city and spend enough time looking up at the night sky this weekend – and the clouds stay away – you should be able to see a few meteors. That said, don’t believe any stories you see about this year’s event being the “brightest shower in recorded human history,” It’s just more fake news. But if you want a chance to see even more meteors, you can drive out beyond the city to places with less light pollution. There are plenty of dark sky maps across the internet that can help you out, like this one. Short of taking a boat to the middle of Lake Erie, it looks like the best bets are a good jog south of Canton or, if you want to stay closer to Cleveland, head southwest, halfway between the city and Mansfield. If organized events are more your thing, the Lake Erie Nature and Science Center has a special event planned for Saturday evening. Be patient, though. The moon will be pretty bright, making it more difficult to see some of the dimmer meteors. Of course, this is all just a precursor to the big event on Aug. 21, when the U.S. experiences something it hasn’t seen in 99 years: a coast-to-coast solar eclipse. And it’s the first time since 1979 that some part of the U.S. mainland will see a total eclipse. All in all, a pretty big deal. Here in Northeast Ohio, close to 80% of the sun will be eclipsed by the moon. But it’s probably there at the back of your mind: It’s such a historic event, but what if I miss it? What if you get stuck in the office? What if it the weather winds up being bad or just cloudy? So far, so good on the forecast. Of course, it’s summer in Ohio which means a thunderstorm could crop up at any time. But what if it does wind up terrible? What if you do wind up missing it? While the U.S hasn’t seen a coast-to-coast total eclipse in 99 years, you won’t have to wait nearly as long to see the next one in Northeast Ohio. Just seven years. 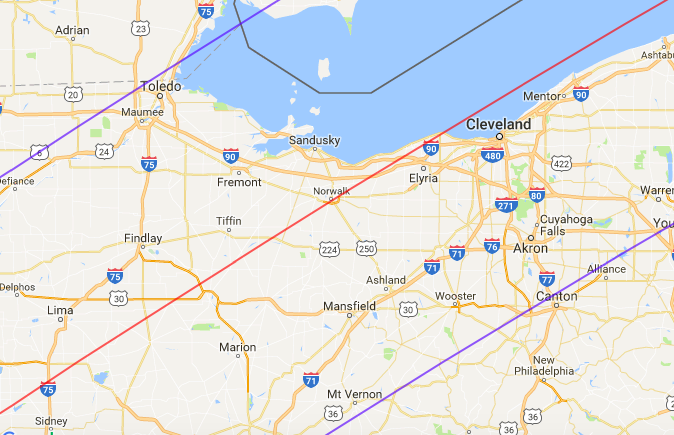 In fact, the solar eclipse coming on April 2024 will have its “path of totality” pass right over the western portion of the Cleveland metro area. The exact path of the moon will pass over communities like Amherst, Lorain, and Avon Lake. If you miss that one, though, your next chance for a total eclipse on U.S. soil won’t come until 2045 when we get another coast-to-coast eclipse that will follow a path similar to this year’s big event.